This unusual cat eye style with a quirky nose bridge comes in a shiny black finish with black temples and snake skin pattern edges. 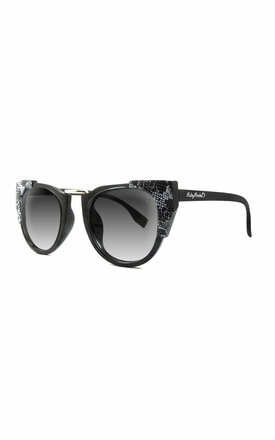 This style is fitted with grad smoke lenses and features the RubyRocks love heart logo on the left hand lens as worn. These lenses offer maximum UVA & UVB protection.